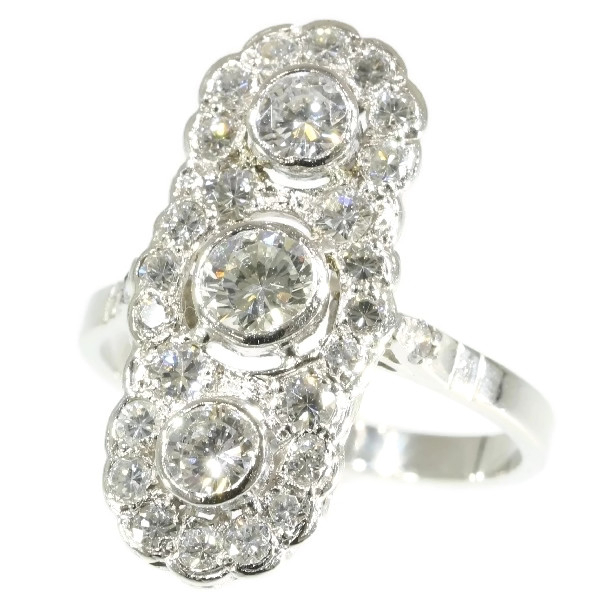 Art Deco engagement ring platinum and diamonds: Description par door Adin Bijoux Anciens. Extra information: Diamond is the birthstone for the month of April, and besides being the most popular gemstone for engagement rings, it is also the anniversary gem for the 10th and 60th years of marriage. Even though the diamond is the hardest of all gemstones known to man, it is the simplest in composition: it is common carbon. The ancient Greeks believed that diamonds were splinters of stars fallen to earth. It was even said by some that they were the tears of the Gods or perhaps crystallized lightning or hardened dew drops. The exact origin of diamonds remained something of a mystery for centuries. In ancient times only kings wore diamonds as a symbol of strength, courage and invincibility. Over the centuries, the diamond acquired its unique status as the ultimate gift of love. It was said that Cupid's arrows were tipped with diamonds which have a magic that nothing else can ever quite equal. But it wasn't until 1477, when Archduke Maximillian of Austria gave a diamond ring to Mary of Burgundy, that the tradition of diamond engagement rings began. Even the reason a woman wears it on the third finger of her left hand dates back to the early Egyptian belief that the vena amoris (vein of love) ran directly from the heart to the top of the third finger, left hand. Diamond(s): One brilliant cut diamond with an estimated weight of ± 0.40ct. (colour and clarity: F/G, vs/si). Two brilliant cut diamonds with an estimated weight of ± 0.44ct. (colour and clarity: F/H, vs/si). Four brilliant cut diamonds with an estimated weight of ± 0.28ct. (colour and clarity: F/H, vs/si). 22 brilliant cut diamonds with an estimated weight of ± 0.66ct. (colour and clarity: F/G, vs/si). Total diamond weight: approx. 1.78 crt.